Keith Munt and his wife Jenny. Keith, a funeral director with many years’ experience, left a large corporate funeral business on what he describes as ethical grounds, having found it impossible to continue focusing on targets and profit rather than on the needs of each bereaved family. Soon after walking away from the corporate world, Keith was offered the opportunity to become a shareholder in a small business that had been started a few years earlier, and he and Jenny are now the sole proprietors of Saint and Forster. They started with a blank canvas, and set out to create something that was personal, beautiful and thoughtful – a complete antithesis to the world Keith had left behind him. The result is extraordinary. Together Jenny and Keith have established a very special undertaking business – and given it the most beautiful home. “We knew we would be spending 12 – maybe 14 or 16 hours a day here,” said Keith, “so we had to make it somewhere that we wanted to be.” Their premises are gorgeous – big comfortable sofas in rich colours invite you to sit and stay, the window display has memory bears and brightly coloured ashes caskets, and thank you cards spill from almost every surface. Many of the beautiful objects around have been given as gifts by families who’ve used Saint and Forster’s services – personal, thoughtful and grateful tokens of appreciation for the work that Keith and Jenny have done for them. And these are treasured gifts, each with a story that Jenny and Keith are humbled and proud to relate. The thoughtfulness shown by bereaved families at the worst time of their lives in choosing and giving a present to the undertakers is something that continues to astound and amaze these lovely people, who are simply doing what their hearts tell them is the right thing to do every time. Keith and Jenny’s commitment to client care and bereavement forms the cornerstone of the company’s business. In Jenny’s words, “unlimited access to the person who has died is a fundamental right”. And they mean it. If you want to be with your relative all day every day then that’s just fine by them – their beautiful chapel with sumptuous, rich decor will be yours for as long as you need. Keith and Jenny are the only full-time employees of the firm; all other staff, from bearers to embalmers, are hired in as needed. More and more clients are coming to Saint and Forster from beyond their immediate area of Darlington, mostly via the Internet, many of them having rung round local funeral companies to compare price and service. In their own literature S&F recommend that clients “speak to at least three [funeral directors], not only to compare prices but also make sure that you feel comfortable with the person you are dealing with”. This is the sort of openness you can expect from them in all your dealings with them. They are exactly the kind of people you would want to find if you needed a funeral director. Jenny is an educational consultant, trainer and examiner in the field of Religious Studies, has an MA in World Religions and is presently researching for a PhD at Durham University. 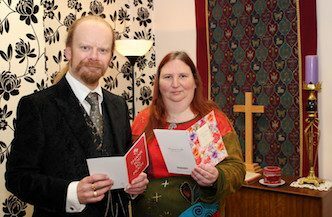 She is active on the local Interfaith council and has used her contacts to broaden the appeal of Saint and Forster: “We even have a pagan celebrant on the books”. Keith is a Fellow of the Royal Society of Arts, an invitation only position based on ethical and innovative business practice. In his spare time he likes to grow rare plants, walk on the moors and visit heritage sites. Affectionately dubbed ‘the Hippy and the Dandy’ by some, they are stylishly individual and exceptionally bright people. Most clients of Saint and Forster prefer a traditional funeral and that’s what they’ll do for you, very smartly, too. If you want a less formal affair, they will be extremely happy to adapt to your dress code and instructions. Says Keith, “The only issue for us is what is going to be helpful or useful to the family. We can be ultra traditional or extremely alternative. We aim to celebrate a unique life in a unique way.” They will also offer you the full range of alternatives to a traditional Mercedes hearse as well as the economical option of their estate car. They really do mean what they say by unlimited access as well. The chapel of rest is literally open all hours for all clients: “For one client we decamped here for the weekend”. In addition, their lovely chapel of rest has provided the venue for small funerals. As you walk in you’ll see a Viking ship. An historically accurate wooden model, it represents their personality in a nutshell. They’re bright, warm hearted and unafraid to be themselves. Their prices are open and broken down clearly for the client. They are also the only funeral directors in Darlington that display their prices online. Clients are made to feel at home in Saint and Forster and their requests are handled with sensitivity. For example, one client had promised her father that she would shave him and “look after him” and Keith made sure she was able to fulfil this request. Prices online here Direct cremation £1665 all-in. Simplest funeral £2,045 all-in. Your call will be answered by Keith or Jenny, day or night. Home Visits? – Yes, they will come and make arrangements with you at your home. Embalming – Not as a matter of course, so ask for it if you want it. If they think it necessary, they will discuss it with you carefully. Continuity of care – Keith and Jenny will be there for you every step of the way and on the day itself. Family Participation – If you’d like to come in and wash and dress the person who has died then they’ll be there for you, to help you or leave you to it. Ethnic Specialism – They are experienced in working with those of other faiths and very knowledgeable about them. Local Celebrants – They have good celebrants on their books and will help find the right one for you. They work closely with their celebrants, with whom they share information and ideas. Web Site – Outstanding is the downloadable price list – a rarity in this business. Lots of really useful information. One of the best websites we’ve seen. Other services -They offer memorial books which provide a pictorial tribute to the life of the deceased using pictures and documents supplied by the family and also a photographic and/or video service at the funeral if required. Other services they can offer include pet funerals, accredited by the Association of Private Pet Cemeteries & Crematoria. Premises – bright and airy, a refreshing change from most funeral directors. Parking – Plenty of on-street parking just outside. We like their commitment to transparent, ethical pricing, and note that they offer very good value for money. They will bring a very personal touch to even the simplest funeral. Saint and Forster is both wholehearted and highly professional. They have a passion for their work. As we’ve already noted, this is a funeral home with a very distinct personality. Call them or drop in, then take it from there. We are grateful to the Rev George Callander, President of the Society of Bereavement Practitioners, for recommending this funeral home. He can’t speak highly enough of it. Keith and Jenny have got to be the most caring and genuine people I have ever met and ever likely to meet. They helped us make our loved ones funeral totally unique and creative. It was more of a celebration of life rather than a standard funeral and was the most fitting way to say goodbye. Keith and Jenny are genuine,caring and compassionate people who worked with myself and my family when planning my mum’s funeral. With their creativity and patience ,they listened to what we wanted whilst at the same time offering creative ideas to make my mum’ s final goodbye the most perfect day . in there time of need that are looking for a first class funeral director please make Saint and Forster your first port of call. Jennifer and Keith are the most professional and caring people you will ever meet. Nothing was too much for them. The price of the funeral was extremely competative. They will answer any questions you may have with considerable warmth and compassion and take you through the whole process from start to finish and make a traumatic time so much easier. I cannot highly recommended them enough. Thank you so much Jennifer and Keith. Excellent from start to finish , i cannot recommend them highly enough!!! So understanding, helpful and considerate, my sincere thanks to Keith and all their staff, my mothers funeral went without a hitch , totally respectful and dignified departure from this world to the next , many thanks!!! I cannot fault the fantastic service and support shown towards me and my brothers when we lost our father in January. When we first met with Keith and Jen we were made to feel at ease that they were going to take great care of our father. They set the bar high that the other funeral directors we met with just couldn’t reach. The service provided was professional and friendly. Everytime we met with them we knew we had made the right choice as they made us feel as though nothing was too much for them to do. You can tell this more than just a job to them this is their calling in life – to help, support and guide people during their time of bereavement. A very highly recommended funeral directors. I would like to thank Keith and Jen for the excellent service and support they have been since losing my Mum on 28th February 2105. It has been a difficult time & Keith guided me through the process seamlessly which is what you need at times like this. The premises and rest rooms are tastefully decorated you leave your loved one knowing they will be cared for. Prices competitive and and personal service you recieve makes you know you have made the right decision for your loved one. I cannot recommend Keith and Jenny enough. They were both totally excellent in their service and support. I was so glad that I had stumbled upon them. They gave me time to breath, to organise Mum’s funeral my way and in my own time. Unlike all the other directors I called, they offered help and totally transparent written estimates upfront, rather than vague figures and an overwhelming sense of urgency and lack of choice. They made an awful time in life better. I have had the very recent pleasure of meeting keith and Jen Munt after selecting them as my Funeral Director of choice. From the first telephone conversation i knew i had made one of the best choices at one of the most important times of my Life. Very honourable , honest and respectful people who turn what is one of the hardest times into a Journey. From our first meeting in my home, nothing was too much trouble. They travelled to me because of the distance from my home to them was lengthy, just for me to feel most at ease and take away the burden and fear of the formality and decisions i was facing at this time. I cannot praise them enough for taking the time and tremendous efforts to deliver an outstanding and personal service. I will never forget them for what they did for me and my family. Having several times been in the situation of having to arrange a funeral for a loved one whilst suffering from the ‘cotton wool brain’ that follows a bereavement, I decided to arrange my own funeral in advance to save my children from having to make decisions at such a difficult time. I want a green burial and approached Saint and Forster because they seemed the most comfortable of local undertakers with this kind of funeral. They are also ‘pet-friendly’ – important to me because I want my dog’s ashes buried with me. I made an appointment for what I thought would be about a 20 minute session during which I would be given information. In fact I found myself there for the best part of 2 hours, chatting with Keith, drinking coffee and in fits of laughter for a lot of the time. What a lovely man he is! He assured me that every little thing I would like was not only possible but was absolutely no problem. If I had been bereaved, numb and vulnerable I would have felt totally safe in his hands. He also provided me with a questionnaire about my funeral wishes, to take away and complete with no obligation whatsoever for Saint and Forster to conduct the funeral. I have now visited a recommended burial site, chosen and paid for my plot and given a copy of the completed questionnaire to my solicitor to hold with my will. My children know exactly what I would like – and are immensely grateful, both to me and to Keith, for getting everything sorted in advance. I cannot recommend Saint and Forster too highly. I am very glad to see Saint and Forster included in the Good Funeral Guide. I have worked with hundreds of funeral director businesses over the years, but Saint and Forster stand clearly head and shoulders above others. They are utterly committed to providing their clients with the very best care, support and service. Keith, Malcolm and Jenny are friendly, funny, respectful and above all compassionate in their approach to the bereaved. Every funeral service I have conducted for Keith and Malcolm has been outstanding – they fill their clients with a very real sense of calm and confidence. I know from dealing with families how much they appreciate the truly personal approach of all at Saint and Forster. It is a great privilege for me as a minister to work with these splendid people. Saint and Forster deserve to grow and prosper. This is bereavement care as it should be delivered.